“The MICHELIN TOUGH ONE EXTREME ENDURO “TT” was delivered in some style from Steve Ireland and the WOR Events team last weekend as the 14th running of the event took on an exciting new format that has been getting fantastic feedback from most of the riders that took part. Graham Jarvis is undoubtedly the best Extreme Rider the World has ever seen and his smooth, controlled, almost perfect style and demeanour on an Enduro bike is a sight to behold. The 43-year-old talisman claimed his 6th Tough One overall win, matching the legend David Knight on event victories, and on this form, no one would bet against Jarvis coming back to take a 7th Title and become the Tough One’s greatest ever competitor in the events history. The new format,TT – Time Trials, was simple and very different from the previous years where it used to be a frantic battle to do as many laps as possible in the 2 or 3-hr duration. This year the riders where sent out on a much fresher and newer design of course from Steve Ireland that allowed for blasts of speed as well as challenging tests of extreme enduro. The Pro riders had a target set of 9 laps, each lap being a timed to the second, special test. They had 3hrs to complete their target laps and could choose when they wanted to do their next lap, allowing for fixing bent bikes, strategic gameplay, drinks, fresh goggles and a short rest to get their energy levels back up to give their all on the next test. It was good stuff and all, but one Pro rider managed to do their target 9 laps in the time allowed. The famous voice of the event Host, Jack Burnicle was keeping the fans up to date with the test times as they appeared on the screen at the event control and there was always lots of activity and people milling around the holding area as the riders waited to attempt their next lap of the gruelling, demanding and infamous 3 mile lap of the Nantmawr Quarry. The lead swapped and changed for the first few laps and it was indeed Jonny Walker with the early lead, followed then by Paul Bolton before Jarvis got down to business and started to whack out the events fastest lap times. After 9 tests it was a winning margin for Jarvis of 1 minute and 15 seconds over second placed Jonny Walker, Walker in great form also took a 1 minutes and 5 second lead to the podium over Jonno Richardson in 3rd spot. Paul Bolton finished 4th and was most certainly on route to a podium finish but a mistake in the last test on a littered Hillclimb cost the best privateer on the Extreme Enduro World circuit very dearly, the lost seconds mounted up and cost the likeable Chorley based rider a valued placing indeed. 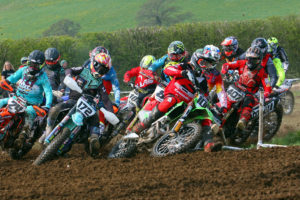 It took the riders a few laps each to get into the swing and flow of the events new format and once they where all accustomed to the terrain and grip levels the riders started to put in superb performances right through the classes. The Expert class was Topped by Jack Spencer with a near 3-minute advantage over Runner Up, Chris Windle. 3rd spot in the Experts went to local rider, Jack Cadwallader a further 5 minutes adrift of Windle. Grant Churchward was the man to beat in the Expert Vets as he blasted to a 41 second advantage over Runner Up, Harold Crawford with Gareth Leonard in 3rd spot, these 3 where the only Expert Vets in class to achieve the 8 laps set by the race organisers. The Morning sessions where for the Clubman, Sportsman, Over 40’s and Over 50’s and these guys had a very similar track (without about 3 or 4 sections) and less target laps to complete in their 3 hr duration. The top rider was Clubman winner, Liam Owens with a 3 minute and 14 second advantage over Runner Up, James Francis and Lee Thomas in 3rd place a further 22 seconds down on Francis. The bulk of the Clubman managed their 7-lap target, but it was gaged just right as there where lots of tired looking riders as they finished off their last laps. Pete Bailey was the man to beat in the Over 40’s with Karl Greenhall taking a well-deserved Runners up spot 2 mins and 54 seconds down on Bailey. Greenhall did his 6 laps really quickly and did well to finish as a nasty off early on left a big lump in his hip that looked nasty to say the least. 3rd Over 40 on the podium belonged to Anthony Crowe, 1 minute and 35 seconds adrift of Greenhall. The unassuming but incredibly talented Gary Mccoy was the Over 50 winner as expected and made the long trip from Devon worthwhile with a comfortable 5 minutes and 27 seconds advantage over Runner Up, Julian Rigby and 3rd placed Murray Shotter a further 7 minutes adrift. Sportsman Victory belonged to Dan Sadler completing his target 5 laps, 7 minutes and 23 seconds ahead of Runner Up, Aden Overend and 3rd placed Ricky Ford only 13 seconds off catching Overend. All the riders doing superb to tackle the new format and daunting terrain with 100 % effort and commitment. The new style and format of the event, an evolving progression and keeping with the WOR Events formula of innovation and leadership within this sport was hailed a success by many, obviously there was some riders that preferred the old style of whacking out the laps and battling on in a hare and hounds format and as is so true in this World, you can’t please all of the people all of the time but you can please some of the people some of the time and that’s is certainly what Steve Ireland and his WOR team achieved here with the new Time Trials (TT) format. The MICHELIN TOUGH ONE has moved the sport of Extreme Enduro on another furlong and the Pro Riders said they where tested as much as ever with the course and duration of the laps, The packed crowd and carpark full of cars had lots to cheer about and again the majority of spectators warmed to the new format once they understood it…so a good guess is that the next TOUGH ONE will be back with a Series of TT’s and maybe even a Hare and Hounds race as well.. watch this space from Steve and the team. THE “FIST FULL OF DOLLARS” SUPER RACE …. What an end to the day!!! Steve Ireland announced the FFOD race in the pre-event blurb and said the top 6 Pro Riders from the TOUGH ONE TT would line up and go head to head on a short 3 minute per lap, bar banging, extreme enduro course, with the winner taking the £500 prize and that it would be a fitting end to a brilliant day, He was so right on so many levels. This 10-minute, 3 lap race would excite the crowd like never before and the action and drama of those 10 short minutes is almost too much to write about. Fans where literally running from side to side of the quarry as they watched an epic battle between Walker, Jarvis, Richardson unfold. From the first corner Walker bossed Jarvis out of the way and rammed himself into the lead, a fall from Walker at the end of lap one allowed the hard Charging Jono Richardson (unsung hero of the entire day !!) to blast through and hold the front runners place. A massive hill in the quarry that was only used for the “FFOD” race had spectators saying that it was impossible, was conquered by the riders with ease as they blasted around the amazing spectacle. Saturday 26TH January THE MICHELIN TOUGH ONE KIDS EXTREME ENDURO. The WOR Events team promised a safe, challenging and enjoyable event for the Kids in the form of the First “Proper” Extreme Enduro for children, The WOR delivered this in spades with 50 kids lining up to take part in a very special event that will live in their memory’s for ever. After the Tough One little brother for kids back in October, Steve Ireland upped the ante for the kids with a new and much improved version of an extreme event that saw that the kids all got the same glistening Michelin Rider Bibs that their heroes from the main race use, the same special number boards with their name and race number on and a tough and technical lap around the same famous quarry that this once a year extravaganza offers. The track was planned to perfection for the 1.5hr duration, with just the right amount of difficulty plotted for the youngsters that ranged from 7 to 14 years old. Doug Lote did him self proud, as did every young warrior that took part, as he blasted to 24 laps, The overall win and class win in the 13-14 yrs category, and a 1 minute and 10 seconds advantage to boot over Runner Up, Brandon Burns (24 laps). 3rd spot was Sion Evans a further 1 minute and 20 down on Burns. In the 11-12 class it was Jack Keenan from the IOM that took victory from Henry Life and Sam Boyd in 2nd and 3rd place respectively. Jayden Jones won the 9-10’s from Runner Up Aled Owen. Bailey Holmes put his electric Beta at the top of the pile in the 7-8’s and kept George Sheldon and Jack Brooks a step down on the podium. All in all the kids Tough One was massive, and definitely housed future champions in this sport, it was a wonderful thing to watch and the camaraderie between all the kids and parent alike was superb with everyone helping out each other in the tough bits. Keep an eye out for more kids’ extremes at future WOR Events specials.